Congratulations on getting a JeVois smart camera. The future of machine vision now lies on your hands. Please take a moment to familiarize yourself with the external features of your JeVois smart camera. If you have received a MicroSD card with all JeVois software pre-loaded, as part of a turnkey package, advance to Safe Handling and Inserting the MicroSD card. All the operating system and machine vision software for JeVois resides on a MicroSD card that you insert directly into the smart camera. Download the pre-packaged JeVois MicroSD card image. This is for cards at least 8GB in size. The JeVois disk image is a raw, sector-by-sector dump of the whole MicroSD card. Flash it to the physical MicroSD as you would with any raw disk image. Attach your microSD card to your computer using a USB-to-microSD adapter or other card reader. Select the .zip image file you downloaded, or the .img file if you have unzipped. Select the drive corresponding to your microSD card. Click flash and wait until complete. Your card is ready to be inserted into your JeVois smart camera. If needed, you can also see detailed instructions here. Avoid electrostatic discharge by using proper grounding when touching the device. Do not push on the center of the fan. It is held by three small prongs that can very easily break. Instead, always hold the smart camera from its sides. Do not disassemble. No user-serviceable parts inside. Consumer-grade device: Do not use in medical or life-sustaining applications, or with heavy machinery. Read and understand the user manual at http://jevois.org/doc before using. Dispose of the device according to your country's requlations about disposal of electronic devices. JeVois is a sensitive high-technology device. Make sure you handle it with care and be especially mindful of protecting the cooling fan and allowing good airflow that is essential for operation. Your JeVois smart camera features a push-push MicroSD card slot: Push until it clicks to insert it, push again until it clicks to eject it. Never try to pull on the MicroSD card. 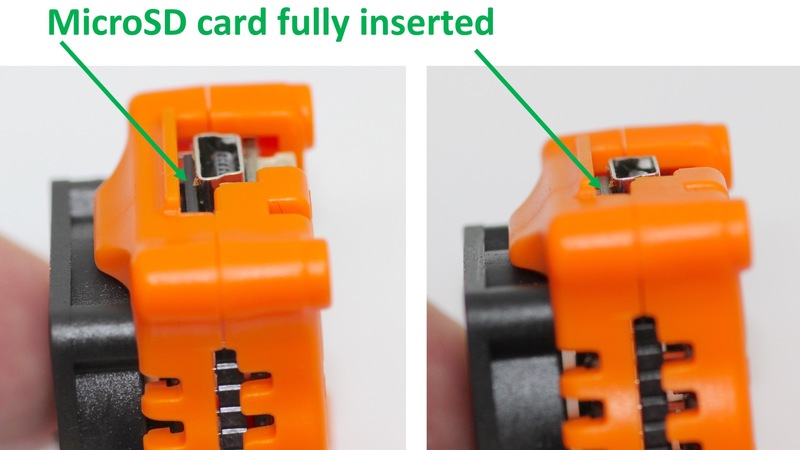 When properly inserted, your MicroSD card should not stick out of the JeVois case, but should be completely in, about 1.5mm or 1/16" past the edge of the mini-USB connector. Click on the photograph above for a high resolution view. Connect mini-USB cable and enjoy! Connect the mini-USB cable to a host computer (desktop or laptop). Make sure you connect your JeVois smart camera to either two USB 2.0 ports (using a Y-type cable that has two USB type-A plugs for two ports on your computer), or one USB 3.0 port. For more guidance, see here. Immediately after connecting mini-USB cable, LED on JeVois smart camera turns green and fan turns on. About 3 to 5 seconds later, LED briefly flashes orange. This means the operating system has correctly started and the camera video sensor is correctly detected. Machine vision software then loads. About 3 to 10 seconds later, LED turns solid orange. This means machine vision software is ready to run and the JeVois camera is announcing itself as a new device to your host computer. Allow a few more seconds for your host computer to detect and configure the smart camera. Then, either: Download JeVois Inventor beta and enjoy! JeVois Inventor is a graphical frontend for JeVois. See the intro to JeVois Inventor to get started. Or: Start a video capture software and enjoy! Linux: sudo apt-get install guvcview && guvcview -ao none -f YUYV -x 640x360 or download an install the free Webcamoid webcam software. Windows: Download and install the free the free Webcamoid, the free Open Broadcaster Studio, or the free AMCap software. Mac: Start PhotoBooth in your Applications folder, or download and install the free Webcamoid or the free Open Boradcaster Studio. Want to discover what your new JeVois smart camera is capable of? Our guided tour will walk you through many of its available machine vision modules, from simple edge detection, to QR-code decoding, to detecting and recognizing objects in complex scenes. Brief explanation of what each machine vision module does. Sample images that you can show to your JeVois camera. Try it out with your kids! The following machine vision algorithms are included and ready to run from the MicroSD card image. More are available, see the user documentation. Object Detect - Object detection and matching using keypoint matching, can learn new objects live. Object Tracker - Color-based object detection/tracking. Demo QR-Code - QR-code and barcode detection and decoding using the ZBar library. Demo ArUco - ArUco augmented reality markers detection and decoding. Road Navigation - Detects road using a edge and texture analysis; from Chang, Siagian and Itti, IROS 2012. Demo Background Subtract - Background subtraction and moving object detection. Optical Flow - Fast optical flow computation using OF_DIS. Saliency SURF - Salient region detection and identification using keypoint matching. Saliency + Gist + Face Detection + Object Recognition - Find salient objects, faces, handwritten digits. Demo Saliency - Visual attention using the visual saliency algorithm of Itti et al., IEEE PAMI, 1998. Demo Eye Tracker - Detect position and orientation of your pupil using the openEyes toolkit. Salient Regions - Extract the most salient regions and send them out for further processing on the host computer. Edge Detection - Detect edges using the Canny algorithm from OpenCV. Edge Detection X4 - Detect edges, running 4 filters in parallel with 4 different settings. Demo CPU + GPU - Image filtering using 4-core CPU processing plus dual-core OpenGL-ES 2.0 shaders on the Mali-400MP2 GPU. Demo NEON - Image processing using ARM Neon acceleration, comparing a box filter (blur) between CPU and Neon. Dense SIFT - Dense SIFT feature descriptors extraction. Save Video - Save captured camera frames into a video file. Convert - Simple module to convert between any supported camera grab formats and USB output formats. Burn Test - Run the quad-core saliency demo while also loading up CPU, GPU and NEON in the background. Note that the BurnTest module is terminal, i.e., you may not be able to switch out of it and to something else. Just quit your video grabber software, unplug your JeVois smart camera, and start again. See the user documentation for more! This means that there is no power or insufficient power to the camera. Check USB cable and USB port. If powering from a battery bank, check that it is charged and turned on. Power seems good but software on the microSD card is not loading. Check that card is fully inserted (see photos above). Check that software has been correctly flashed. Power seems ok (at least during startup) and software on the microSD card loads and starts. This suggests that the JeVois hardware is working as expected, yet your host computer fails to properly stream video from it. We have been able to reproduce this condition when using "thin" USB cables, not specified as charging+data cables, but instead specified as data sync cables, and not featuring 28/24AWG wire thickness. The critical number here is 24AWG, which means that the wires in the USB cable that carry power to the camera are thicker and can carry more current. Try a high-quality 28/24AWG or better (28/22AWG, or even 28/20AWG if you can find some; the lower the AWG value, the thicker the wires). We have had good reports with Monoprice brand mini-USB cables that mention 24AWG in their specs, available from Amazon, Newegg, Ebay, etc. For more details and pictures, see here. and also see the JeVois Tech Zone community forum for user tips and discussions. In particular, it seems that older Mac OSX versions may have difficulties recognizing the JeVois camera, and upgrading to the latest OSX solves the issue. Other reports of failures to start have been solved by getting better USB cables and/or more fully inserting the microSD card. Just email us at jevoisinc@gmail.com and we will help you! See the master documentation for JeVois at http://jevois.org/doc/ for more information.